JUST out of curiosity, and because he possesses what is called the wandering foot, which means that he delights to roam about, Peter Rabbit had run over to the bank of the Big River. There were plenty of bushes, clumps of tall grass, weeds and tangles of vines along the bank of the Big River, so that Peter felt quite safe there. He liked to sit gazing out over the water and wonder where it all came from and where it was going and what kept it moving. He was doing this very thing on this particular morning when he happened to glance up in the blue, blue sky. There he saw a broad-winged bird sailing in wide, graceful circles. Instantly Peter crouched a little lower in his hiding-place, for he knew this for a member of the Hawk family and Peter has learned by experience that the only way to keep perfectly safe when one of these hook-clawed, hook-billed birds is about is to keep out of sight. So now he crouched very close to the ground and kept his eyes fixed on the big bird sailing so gracefully high up in the blue, blue sky over the Big River. Suddenly the stranger paused in his flight and for a moment appeared to remain in one place, his great wings beating rapidly to hold him there. Then those wings were closed and with a rush he shot down straight for the water, disappearing with a great splash. Instantly Peter sat up to his full height that he might see better. "It's Plunger the Osprey fishing, and I've nothing to fear from him," he cried happily. Out of the water, his great wings flapping, rose Plunger. Peter looked eagerly to see if he had caught a fish, but there was nothing in Plunger's great, curved claws. Either that fish had been too deep or had seen Plunger and darted away just in the nick of time. Peter had a splendid view of Plunger. He was just a little bigger than Redtail the Hawk. Above he was dark brown, his head and neck marked with white. His tail was grayish, crossed by several narrow dark bands and tipped with white. His under parts were white with some light brown spots on his breast. Peter could see clearly the great, curved claws which are Plunger's fishhooks. Up, up, up he rose, going round and round in a spiral. When he was well up in the blue, blue sky, he began to sail again in wide circles as when Peter had first seen him. It wasn't long before he again paused and then shot down towards the water. This time he abruptly spread his great wings just before reaching the water so that he no more than wet his feet. Once more a fish had escaped him. But Plunger seemed not in the least discouraged. He is a true fisherman and every true fisherman possesses patience. Up again he spiraled until he was so high that Peter wondered how he could possibly see a fish so far below. You see, Peter didn't know that it is easier to see down into the water from high above it than from close to it. Then, too, there are no more wonderful eyes than those possessed by the members of the Hawk family. And Plunger the Osprey is a Hawk, usually called Fish Hawk. A third time Plunger shot down and this time, as in his first attempt, he struck the water with a great splash and disappeared. In an instant he reappeared, shaking the water from him in a silver spray and flapping heavily. This time Peter could see a great shining fish in his claws. It was heavy, as Peter could tell by the way in which Plunger flew. He headed towards a tall tree on the other bank of the Big River, there to enjoy his breakfast. He was not more than halfway there when Peter was startled by a harsh scream. He looked up to see a great bird, with wonderful broad wings, swinging in short circles about Plunger. His body and wings were dark brown, and his head was snowy white, as was his tail. His great hooked beak was yellow and his legs were yellow. Peter knew in an instant who it was. There could be no mistake. It was King Eagle, commonly known as Bald Head, though his head isn't bald at all. The bald or whiteheaded Eagle. His head, neck and tail are snowy white. One of our largest hawks, brown above and white beneath. Peter's eyes looked as if they would pop out of his head, for it was quite plain to him that King Eagle was after Plunger, and Peter didn't understand this at all. You see, he didn't understand what King Eagle was screaming. But Plunger did. King Eagle was screaming, "Drop that fish! Drop that fish!" Plunger didn't intend to drop that fish if he could help himself. It was his fish. Hadn't he caught it himself? He didn't intend to give it up to any robber of the air, even though that robber was King Eagle himself, unless he was actually forced to. So Plunger began to dodge and twist and turn in the air, all the time mounting higher and higher, and all the time screaming harshly, "Robber! Thief! I won't drop this fish! It's mine! It's mine!" Now the fish was heavy, so of course Plunger couldn't fly as easily and swiftly as if he were carrying nothing. 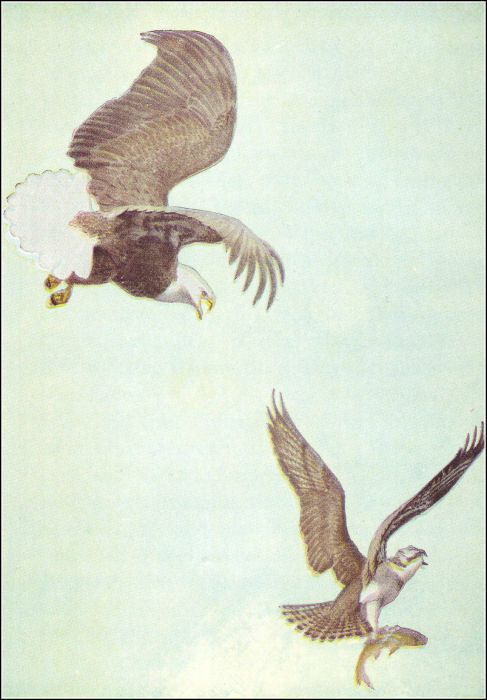 Up, up he went, but all the time King Eagle went up with him, circling round him, screaming harshly, and threatening to strike him with those great, cruel, curved claws. Peter watched them, so excited that he fairly danced. "O, I do hope Plunger will get away from that big robber," cried Peter. "He may be king of the air, but he is a robber just the same." Plunger and King Eagle were now high in the air above the Big River. Suddenly King Eagle swung above Plunger and for an instant seemed to hold himself still there, just as Plunger had done before he had shot down into the water after that fish. There was a still harsher note in King Eagle's scream. If Peter had been near enough he would have seen a look of anger and determination in King Eagle's fierce, yellow eyes. Plunger saw it and knew what it meant. He knew that King Eagle would stand for no more fooling. With a cry of bitter disappointment and anger he let go of the big fish. Down, down, dropped the fish, shining in the sun like a bar of silver. King Eagle's wings half closed and he shot down like a thunderbolt. Just before the fish reached the water King Eagle struck it with his great claws, checked himself by spreading his broad wings and tail, and then in triumph flew over to the very tree towards which Plunger had started when he had caught the fish. There he Hisurely made his breakfast, apparently enjoying it as much as if he had come by it honestly. As for poor Plunger, he shook himself, screamed angrily once or twice, then appeared to think that it was wisest to make the best of a bad matter and that there were more fish where that one had come from, for he once more began to sail in circles over the Big River, searching for a fish near the surface. Peter watched him until he saw him catch another fish and fly away with it in triumph. King Eagle watched him, too, but having had a good breakfast he was quite willing to let Plunger enjoy his catch in peace. Late that afternoon Peter visited the Old Orchard, for he just had to tell Jenny Wren all about what he had seen that morning. "King Eagle is king simply because he is so big and fierce and strong," sputtered Jenny. "He isn't kingly in his habits, not the least bit. He never hesitates to rob those smaller than himself, just as you saw him rob Plunger. He is very fond of fish, and once in a while he catches one for himself when Plunger isn't around to be robbed, but he isn't a very good fisherman, and he isn't the least bit fussy about his fish. Plunger eats only fresh fish which he catches himself, but King Eagle will eat dead fish which he finds on the shore. He doesn't seem to care how long they have been dead either." "Doesn't he eat anything but fish?" asked Peter innocently. "Well," retorted Jenny Wren, her eyes twinkling, "I wouldn't advise you to run across the Green Meadows in sight of King Eagle. I am told he is very fond of Rabbit. In fact he is very fond of fresh meat of any kind. He even catches the babies of Lightfoot the Deer when he gets a chance. He is so swift of wing that even the members of the Duck family fear him, for he is especially fond of fat Duck. Even Honker the Goose is not safe from him. King he may be, but he rules only through fear. He is a white-headed old robber. The best thing I can say of him is that he takes a mate for life and is loyal and true to her as long as she lives, and that is a great many years. By the way, Peter, did you know that she is bigger than he is, and that the young during the first year after leaving their nest, are bigger than their parents and do not have white heads? By the time they get white heads they are the same size as their parents." "That's queer and its hard to believe," said Peter. "It is queer, but it is true just the same, whether you believe it or not," retorted Jenny Wren, and whisked out of sight into her home.